As a dietary supplement, mix one (1) scoop into 6-10 ounces of ice cold water (or to desired level of sweetness) prior to exercise, or on off-days first thing in the morning. If tolerated well, an additional serving can be had. Pair with a healthy diet for maximum results. Do not use late in the evening if stimulants, such as caffeine, keep you awake. Do not exceed more than three (3) servings in a 24 hour period. As a dietary supplement, mix one (1) scoop into 6-10 ounces of ice cold water (or to desired level of sweetness) prior to exercise, or on off-days, first thing in the morning. If tolerated well, an additional serving can be had. Pair with a healthy diet for maximum results. Do not use late in the evening if stimulants, such as caffeine, keep you awake. Do not exceed more than (3) servings in a 24 hour period. KEEP OUT OF REACH OF CHILDREN. STORE IN A COOL, DRY PLACE. TAMPER EVIDENT: DO NOT USE IF SEAL UNDER CAP IS BROKEN OR MISSING. WARNING: THIS PRODUCT IS ONLY INTENDED TO BE CONSUMED BY HEALTHY INDIVIDUALS OVER THE AGE OF 18 YEARS. Consult your physician prior to use if you are pregnant or nursing. Consult your physician prior to use if you are taking any medications or have any medical condition. Do not exceed recommended use. Improper use will not improve results. Discontinue use and seek professional assistance immediately if you are experiencing unwanted side-effects. Discontinue use 2 weeks prior to surgery. Sep 11, 2018 Sparta Nutrition’s Keto MRP: A Matcha-Flavored Keto Meal Replacement! 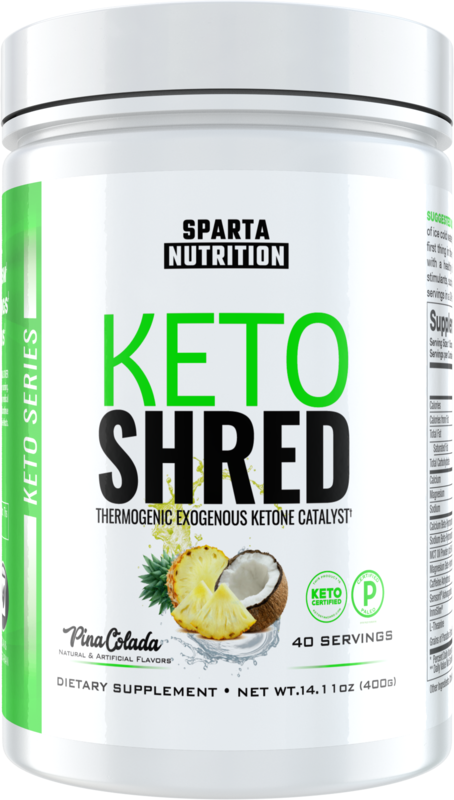 Keto Shred: Premium Ketogenic Fat Burner Thermogenic. Have you noticed that there are way too many fat burners on the market these days? But more importantly, have you noticed that there’s still a specific product-type that’s been missing? And finally, are you on #teamketo? If you answered “yes” to any of the above questions then you’ve come to the right place. Meet Keto Shred -- the very first keto-friendly powdered fat burner on the market! When the idea for a ketogenic-friendly fat-burner first tickled our prefrontal cortex, we immediately looked at the competition we’d face on the market. Imagine our shock when we discovered that we had embarked into mostly uncharted waters. While there are signs of life in this unexplored paradise, they’re nothing more than shipwrecks in the face of Keto Shred. As the first product that matters in this space, we get to set the commandments. THOU MUST BE KETO-FRIENDLY AND NATURALLY SWEETENED. Ketosis is a fickle state to exist in. A single ingredient can kick you right out of fat-adapted land. To be safe, we only used nature sweeteners in Keto Shred that are keto-friendly... and we avoided artificial sweeteners while doing so. THOU MUST INDUCE THERMOGENIC DRIVEN WEIGHT LOSS. THOU MUST CONTROL APPETITE AND BOOST METABOLISM. Calories in vs calories out, once again, is the name of the game - even in keto. A good “burner” product helps you maximize both halves of the equation. Keto Shred helps you maximize the adage: eat less, move more. In addition, it may even help you burn more without moving by amplifying your fat-utilizing state of ketogenesis. * Beat that. As mentioned above, these goBHB electrolytes have GRAS status with the FDA, and that's why we stick with them - they're the trusted, patented version from our expert ingredient partners at Compound Solutions. Now it's time for the feel-good part of Keto Shred -- as if getting into ketosis didn't feel great as it was! Ashwagandha is one of the most studied supplements in the world — so we went with the best formulation. So we threw in a massive dose of Sensoril. KETO SHRED: A KETO DIETER'S DREAM SUPPLEMENT.